I absolutely love fall, its hands down my favorite season. To me it signifies a new year, a new beginning, a fresh start, so much more than January does. In the season that buzzes with anticipation you can choose to wear scarfs, blazers, tights, boots, etc. because you want to, not because you have to. Where you can drink your coffee hot or cold, where you can finally take a walk outside without dying from the heat or shivering from the cold. I think what I love most about this wonderful season is the flavors: clove, cinnamon, nutmeg chocolate, sage, caramel, and best of all pumpkin! Whether it be in lattes, cakes, muffins, cookies, cheesecakes, candles, fabrics, or in its natural state it always makes me smile. 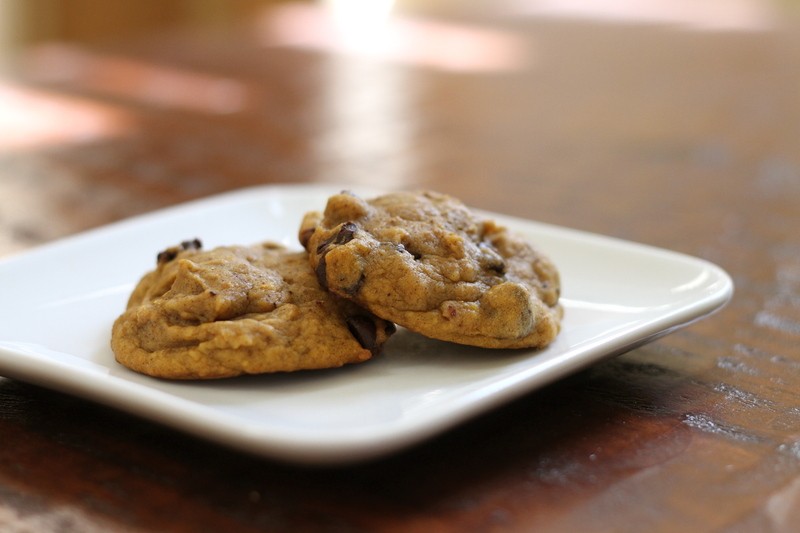 So, to celebrate the coming of my favorite season I want to share with you a delicious recipe: Pumpkin Chocolate Chip Cookies. I first tried these cookies when my college roommate Meggie made them for us junior year (3222 ) and I’ve tweaked and adjusted various recipes since then and found this to be my go to.